Celtic striker Leigh Griffiths will be “out of football for a little period of time” as he receives help with “ongoing issues”, including some relating to his mental health, says Brendan Rodgers. The Scotland forward, 28, has made 22 appearances in a stop-start season that has been disrupted by injuries. Griffiths withdrew from the Scotland squad to face Israel and Portugal in October to focus on his fitness. “Leigh has had issues for a number of months,” Celtic manager Rodgers said. Rodgers declined to elaborate on the issues, calling them “confidential”, but said Griffiths “needs to find a happiness”. “He’s a great guy but football and life is tough for him right now,” Rodgers added. “We want to help him with that and we’ll let you know when he’s back. “I’m very close with him. We have a strong relationship and he’s had a number of issues outside of football. “Thankfully for him, for the issues that young players and young people in general can come across, there is great support out there. “It’s no longer a weakness to talk now. Forget football, think of the guy as a human being and take it from there. 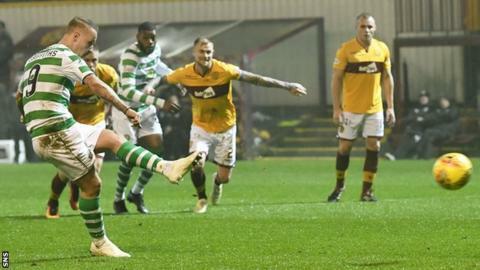 Griffiths has scored six goals this season, the most recent in Celtic’s 3-0 win over Hamilton Academical on 24 November.